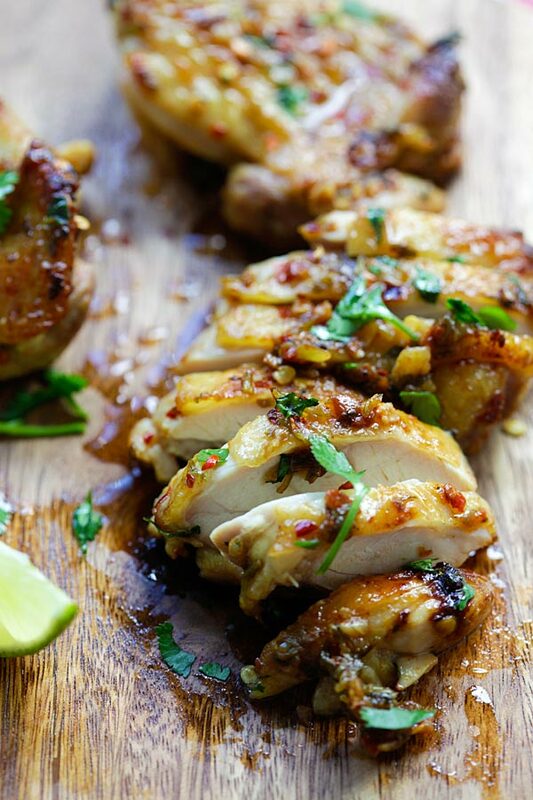 Cilantro Lime Chicken - juicy Mexican chicken marinated with cilantro, lime juice and garlic. Pan-fry, bake or grill the chicken with this easy recipe! 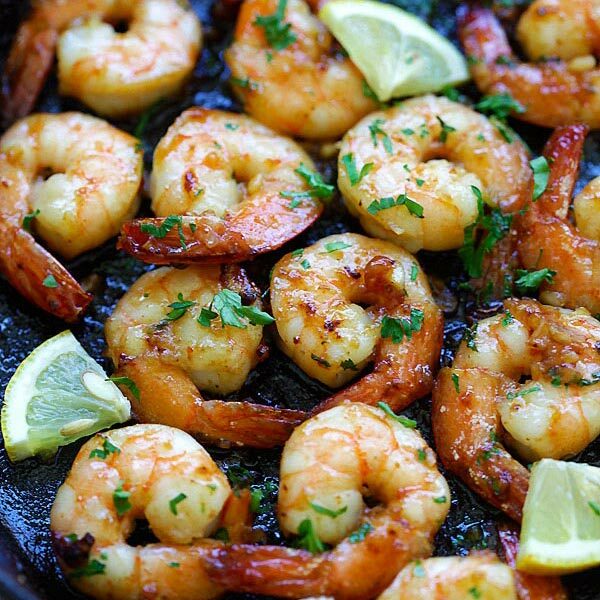 Serve with side dishes such as Cilantro Lime Rice, Tequila Lime Shrimp or make taco salad with the chicken. How to Make Cilantro Lime Chicken? 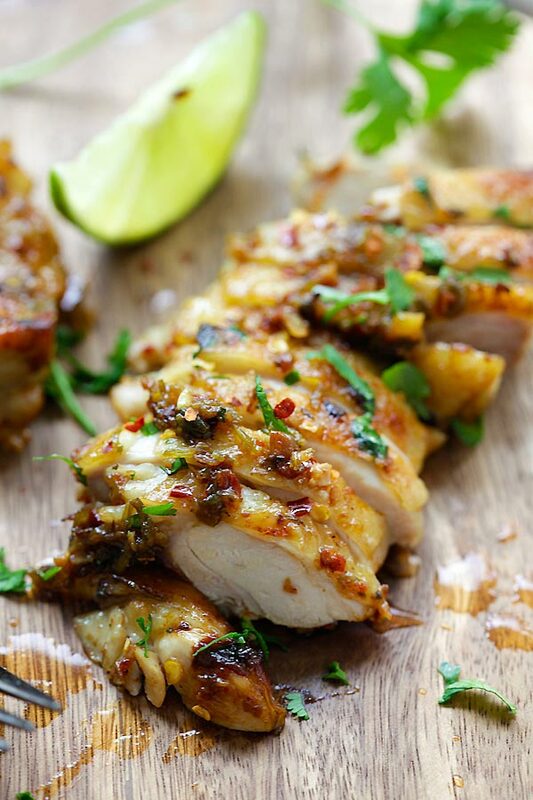 Zesty, moist, juicy baked chicken with mouthwatering marinade is sure-fire way to tantalize your palate and appetite. This is one my favorite Mexican recipes and I have the perfect baked cilantro lime chicken recipe for you. This recipe couldn’t be any easier as simple ingredients are all you need. Aromatic cilantro, fresh lime juice, garlic, chili flakes are the main ingredients that bring out the explosive flavors of the chicken. To make this easy recipe, first you marinate the chicken for 15 minutes, then pan-fry in a skillet for a few minutes before baking it for 20 minutes. It’s that easy! Olive oil. This will keep the chicken moist and juicy. Use chicken thighs, which are more tender, moist and juicy. Buy bone-in and skin-on chicken thighs and debone it. Click on this post to learn how to debone chicken thighs, with video guide. You can use skinless and boneless chicken breasts or chicken thighs, if you like. Use freshly squeezed lime juice if you can. You will love the fresh and citrusy aroma from the lime juice. 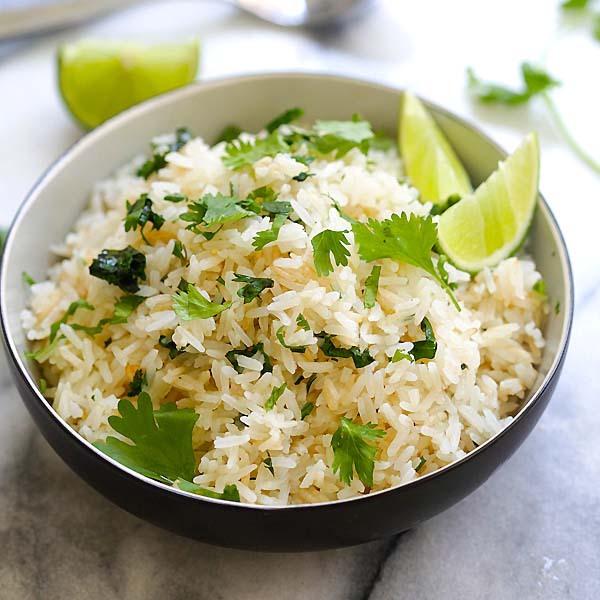 Use lots of cilantro stems and some cilantro leaves as there is a lot of flavors in the stems. Pan-fry the chicken on a skillet first, to make sure that the skin is browned and crispy before baking the chicken in the oven. This extra step turns your cilantro lime chicken from good to exquisite. For a wholesome meal and easy weeknight dinner, I recommend the following recipes. Cilantro Lime Chicken - juicy Mexican-inspired chicken marinated with cilantro, lime juice and garlic. You can pan-fry, bake or grill the chicken with this easy recipe! Whisk all the Marinade ingredients together in a big bowl, mix well. Add the chicken into the Marinade, stir to coat well. Marinate for 15 minutes but best for 2 hours. Heat up a skillet and pan-fry the chicken with the skin-side down until slightly browned. Turn over and pan-fry the other side of the chicken until slightly browned. Transfer the skillet into oven and bake for 20 minutes. Transfer the chicken and the Marinade residual (after baking) to a serving platter (discard the oil), squirt some fresh lime juice and garnish with cilantro, serve immediately. Make sure you use an oven-safe skillet or pan before baking the chicken in the oven. You may also grill the chicken. 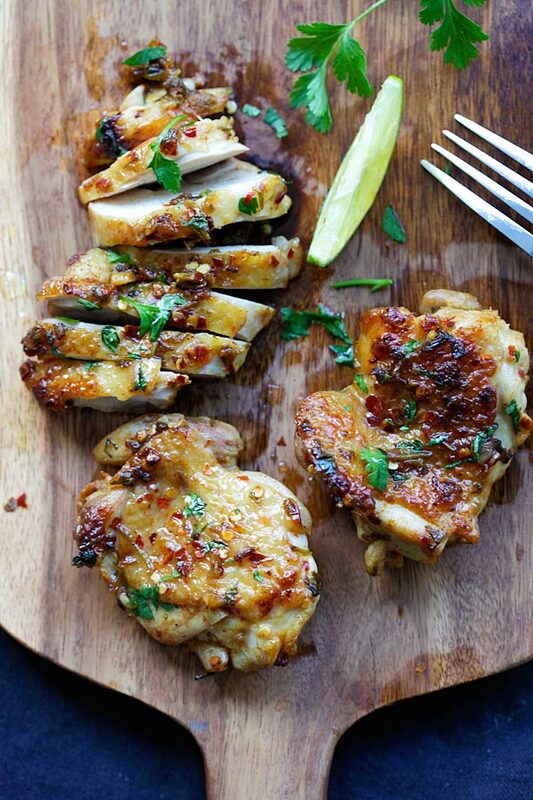 For the chicken, you can use boneless and skinless chicken breast/chicken thighs or bone-in chicken thighs. Love cilantro and lime in this chicken because it adds lots of flavor but not calories ~ which my Doc says I don’t need right now. High cholesterol and I’m only 36! Wants to put me on cholesterol lowering drugs even though I’m in a good weight range. So it’s healthy eating for me, would rather change my diet than go on drugs! Hi! This recipe is SO GOOD and great reheated. I can’t stop eating it! I’m a little confused about the calorie count – it says 1/3 the recipe = 630 calories, but is that the amount for 1 1/2 pounds of chicken? I cook this with chicken breasts and it’s delightful. Thanks for changing my life!! Can you make this with chicken drum sticks? Hi, your narration mentions use of garlic but garlic is missing from your recipe. Oops, thanks for pointing out. Updated. I made this for dinner last night… it was delicious! Maybe I read the recipe wrong but if you put the leftover marinade on the finished chicken be sure to boil it first. This will kill any bacteria that it might have gotten from the raw chicken. You’re right, any marinade from raw chicken needs to be cooked. Otherwise food poisoning big time! Food blogger basics surely. Of course. That’s just common sense. No one would use the marinade (before cooking). I meant the dripping. I would suggest boiling the marinade after it is used if you plan on adding it back to the chicken at the end. This will kill any bacteria it might have gotten from the raw chicken. Hi Randy, thanks for letting me know. I meant the marinade residual (after baking) on the chicken…thanks for letting me know. Hi was planning to make this Tonite but marinated chicken breast in cilantro lime over nite and then read not to over nite. Should I not prepare it.what will happen if I do? This looks absolutely fabulous. I will make it this week! 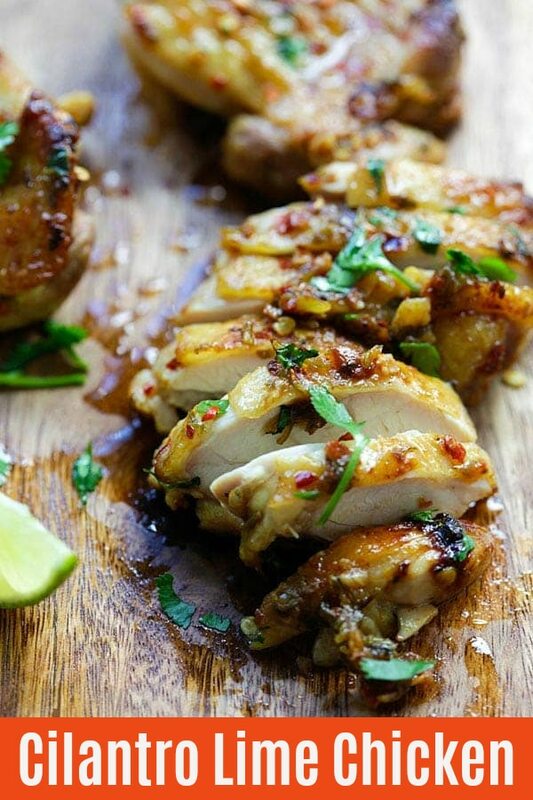 Great, try it I am sure you will love this cilantro lime chicken. Need to make these immediately! My mouth is watering! How long would you cook the boneless skinless chicken breast? About the same time, or a couple of minutes longer. Thank you. I have defrosted breasts in my frig, along with cilantro, lime juice & zest and garlic. I made a smiliar marinade for boneless top sirloin fajitas tonight. Added soy sauce, worsterschire, chili powder, cumin, red pepper flakes, dash of cayenne., lime juice & zest. Sauteed orange & green peppers, white & red onions in same marinade. Was so yummy. I’m allergic to cilantro. Could you recommend something to use instead? Perhaps you can use Italian parsley. I am making this tonight? I can’t wait! What side or sides would you recommend? Your recipe says to marinate for 15 minutes, but is there any harm in marinating longer (like overnight)? The colour of the chicken is mouth watering and the lime too. Thanks for the fabulous cilantro lime chicken :) I’m too a chef like you. And thanks for the chicken story I’ll definitely try with some white wine. Ooo. I’m so excited for this one. My husband loves this flavor but I always have to use a packet. He’s gonna love this. Thanks!! 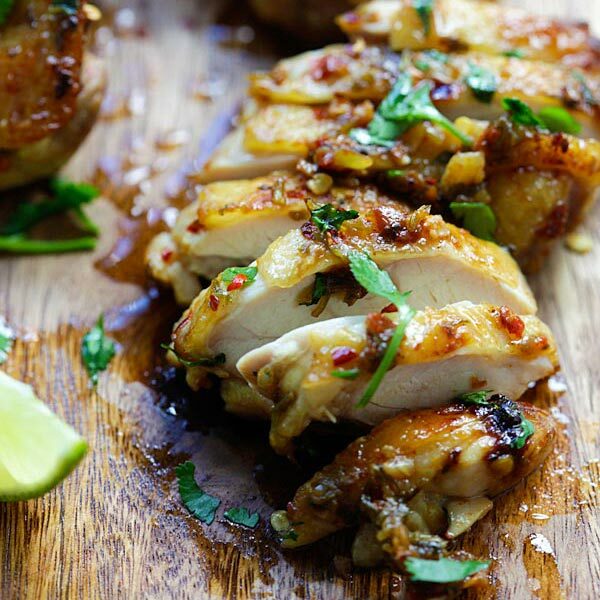 You will love this cilantro lime chicken recipe. I enjoy reading all the comments. I just wish more people would comment after they have actually made the dish so that’s what I am going to do. I followed the recipe as stated (I did use a bit more red pepper flakes because my family likes spicy) and let me tell you – this was one of the best chicken recipes I have ever made!!! I did use boneless chicken thighs andt they were also skinless but I don’t think it took away from the flavor at all…they still browned up nicely! Not only is it easy but there is not a long list of ingredients (most of them I already had) and I was able to make this after working all day. My daughter and husband loved this recipe and I am making it again tonight. Thank you for this recipe!! Oh, I served this with a German cucumber salad that was a nice contrast with the spice of the chicken. There were NO leftovers! Super delicious. I added some jalapeño’s before putting the chicken in the oven and it gives it an awesome spicy flavor. I made this on boneless skinless chicken thigh and it was really yummy. Thanks for this recipe! Thanks Anna for trying my cilantro lime chicken recipe. We went with no skin too and did 2-3 minutes under the broiler at the end. Served it with Hong Kong style noodles with broccoli and kale — so delicious and we are looking forward to the leftovers! Thanks for trying my cilantro lime chicken recipe. This recipe was fantastic! We’ve recently traveled to Vietnam and Laos. This dish reminded us of our trip and the fabulous cuisine. I wonder if you could suggest side dishes to compliment the Cilantro Lime Chicken and round out the meal? Thank you for another delicious recipe! Quick question, could I put everything in a ziplock bag and freeze to use another time? Yes you can for another time. Thank you for this recipe. It was easy, quick and really good. I am happy to add this to the rotation. The only thing I did different was add a little seasoning to my chicken as I always do in recipes, even if it doesn’t call for it. I severed it with cilantro lime rice, black beans, flour tortillas and salsa. The next time I think I’ll add more pepper flakes and tiny more lime juice. I can’t wait to make it again! Hi Kimberly, thanks for trying my cilantro lime chicken recipe. This marinade was perfection. I used boneless skinless thighs, grilled. I served it on corn tortillas with a fresh mango pineapple salsa and avocado crema. Amazing!! I just made this tonight (actually eating it now) and it is DIVINE! The flavors are perfect! I am used to a lot more seasonings (combined) and was pleasantly surprised how flavorful this is. I am on a VERY strict diet so I am very limited. There is only so much you can do with chicken breast before you’re sick of it! LOL This will definitely be added in my rotation. I am glad I made extras. I cannot have oil, so I did not use oil in my recipe. I also used chicken breast strips…they did not brown in the pan very well (as expected), however, they sizzled and browned in the oven. So, they came out great. Because the portion of meat is so small, after pan frying, I placed them in the oven for 10 minutes then flipped them and cooked for an additional 7 minutes. I probably could lower this (5-7 min each side) to make them even more moist. Nonetheless…this is a great recipe! Hi! I know maybe this is a stupid question but do you add salt to the chicken at some point? Salt is in the marinade. So do you cook the marinade in the same skillet as the chicken when you bake it on the oven? The directions are a little confusing to me…. Yes, you transfer the whole skillet into the oven. After it’s done, scoop the marinade residual in the skillet on top of the chicken. They are the best. Ok thanks, excited to try it!! Maybe I missed this, but what temperature do you set the oven? This was great. I pretty much followed recipe as remembered after I read it. Did salt and pepper thighs before marinating for two hours. Pulled out of fridge an hour before cooking. Served with Rasa garlic noodles, and kimchi purchased from local Asian grocery. Will make again. Hi Karen, thanks for trying my cilantro lime chicken. Can you just bake it without pan frying?? I don’t have the right skillet to transfer ?I want to make this tonight if possible sounds sooooo delish? Yes you can just bake right away. Pan-fry make the skin and meat part crispy. How many degrees in the ovn? Made this last Friday night and it was AMAZING! Great flavor combinations! It looks just yummy! I feel water in my mouth. It’s really a delicious recipe. Can I use honey in this recipe? Thanks Rasa for giving us such type of recipe. Yes you can add some honey. It will be even better. Tried this for a quick and healthy dinner today! 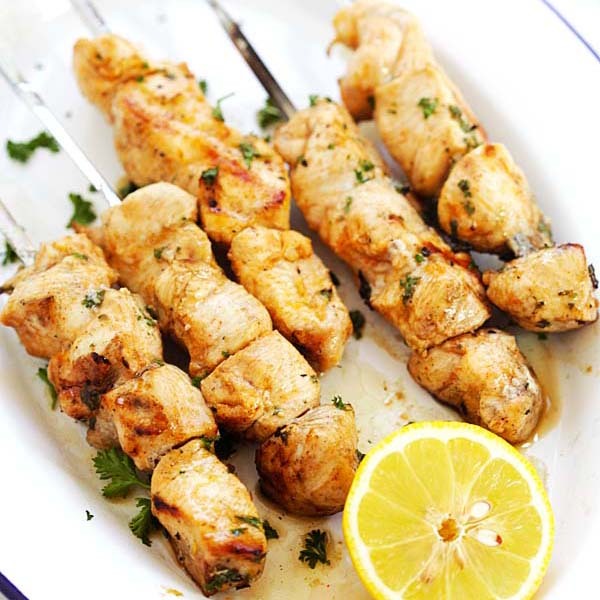 Delicious – I used boneless skinless chicken breasts. I did also season the chicken breasts with salt and pepper and rosemary prior to putting it in the marinade. I let it marinate for 1 hour then sautéed on the stove before popping in the oven for the 20 mins at 375 – it cooked perfectly. I also charred a jalapeño pepper and mixed that in after I took it out of the oven. Served over white rice and topped with avocado. Great recipe thank you for sharing it with us! Hello, can i subsstitue with bone in chicken thighs? How many chicken thighs did you use for this recepie, I would need to make about 18 chicken thighs with this recepie. Thank you! Yes, you can use bone-in. I think 4 thighs. This recipe looks so yummy I just had to make it. The chicken is in the fridge marinating as I type this. I can’t wait to try it! My husband is not a big fan of lime but as delicious as this looks, I bet he will be after eating this! He loved it and asked that I make it again. Thank you for a great recipe! Looks yummy! We like skinless + no bones, should I still pan fry the chickens before I bake? Thank u! You can, but you don’t have to. Pan-frying will make it even better though. I love lime and cilantro together! I fixed this and made some a pico de Gallo salad with it! Everyone loved it! Thanks so much! Thanks for trying my recipe. Had a great family lunch with the Cilantro lime chicken. Easy to get ingredients, easy marination, and fast cooking. Came out perfect. I topped my chicken breasts with mozzarella cheese and had a side of family fresh green salad. Yummy. Yummy, mozzarella cheese sounds like a great idea!! Thanks for trying my cilantro lime chicken. I made this chicken tonight and it was the BEST I have ever made! My husband doesn’t like too much hot so he used the lime juice liberally! Wow! He said its his new favorite! Thanks so much for the recipe! I plan to make it often and for family get togethers! Delish! This looks delicious and I’ve got it marinating right now. I have a question though… As I am having a hard time letting summer go, I’d like to grill these babies up instead of putting the oven on. Should they be pan fried before grilling or do you feel that step can be skipped and they can go right on a preheated grill? I’d love feedback if anyone has tried grilling them in the past. Thanks!!!! I always grill them and it’s the best! I grill almost everything no matter the weather! This is the best chicken recipe ever and so many possibilities..
Hi Christina, awwww, your comment just made my day. Yes grilling makes everything better. Thanks for trying my cilantro lime chicken recipe. 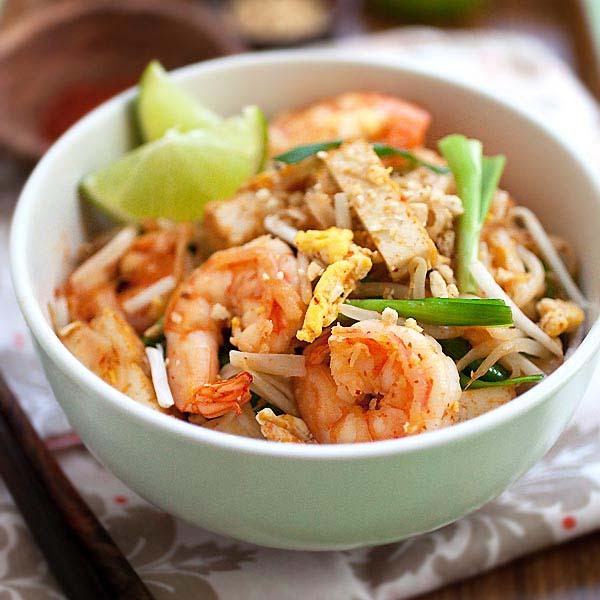 Just tried this recipe….. great flavors, delicious! I used chicken tenderloins. This is my favorite recipe on Pinterest! My question is.. Can you make it ahead of time? Put everything together and freeze it to cook another time? I saw in another post you said the lime would start to cook it, but if you put everything together and throw it in the freezer?? Is it ok.. I love this recipe….and, moreover, my husband LOVES it, too. thank you so much, it’s really delicious! This was delicious! I added chili powder and it was yummy to my tummy. I made a vinaigrette of olive oil and cilantro and lime juice and drizzled it over the cooked chicken with a side of garlic mashed potatoes. Great idea, I will have to try! Hey, any idea the nutrition facts for this? 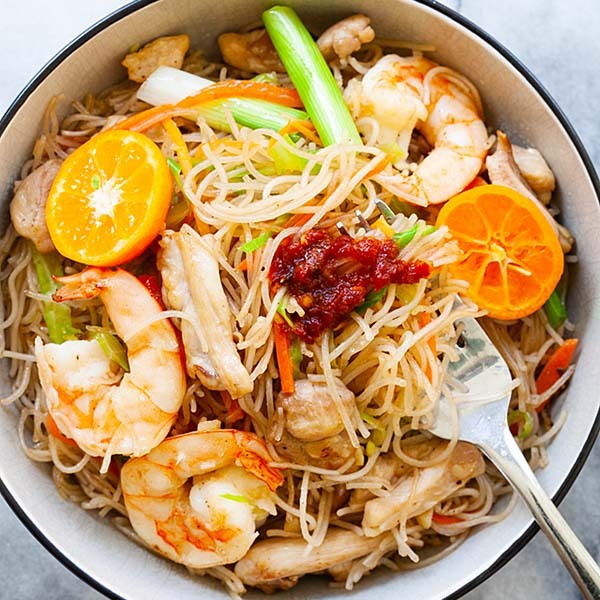 I am trying the keto diet and would love to eat this! I have read all of the comments, I am marinating as we type. Please advise: Does the chicken brown in the skillet with the marinade? If not, do you add it in the skillet before placing in the oven? I dont want to mess this up, my husband is looking forward to it. Yes, the chicken will brown a little on the skillet but won’t cook completely. So finish in the oven to cook through. Would this be good with a mango pineapple salsa poured over it?? I have cilantro chicken breast lemon and cucumber I have powdered onion and garlic what should I do…. My family and I are trying to eat healthier and were not the best at it.. Any suggestions? I made this yesterday for lunch for a few friends and they all LOVED IT, and so did I!! I used skinless chicken breasts so didn’t pan fry it, I directly popped it in the oven for 20 min at 375 F and then broiled it for a couple of minutes. Served it with quinoa and baked Asparagus. It was sooooooooo tasty! I again made it for dinner for my husband and he loved it, too! Thank you so much for the absolutely healthy and delicious recipe! *I just used 1&half tbsp of olive oil. It still was yummy! Hi Deepika, I am so happy that you liked my cilantro lime chicken. Do try out more recipes from me. I love this recipe! I’m making it today for my mother and she can’t have the red pepper flakes, will not adding it ruin the dish? It’s fine but it will be plain. Okay are you supposed to add the marinade to the pan before you pan fry, or before you put it in the oven?? My question as well ? I’m confused about marinade. Do I add all the marinade to the skillet with the chicken? Made this last night according to the recipe, except I used bone-in thighs. What a delight! Easy and delish. Accompanied with the Skillet Chili Lime Corn recipe. What a great evening paired with a crisp rosé. I have made this numerous times and my whole family loves it! I have tried both skinless thighs and breasts, but the thighs turn out better, in my opinion. We grill it and serve it in tacos with rice, beans, charred corn, and other taco fixings, but it’s almost better just on its own. I made it for a group and got rave reviews from all. It’s now one of my go to recipes! Thanks! 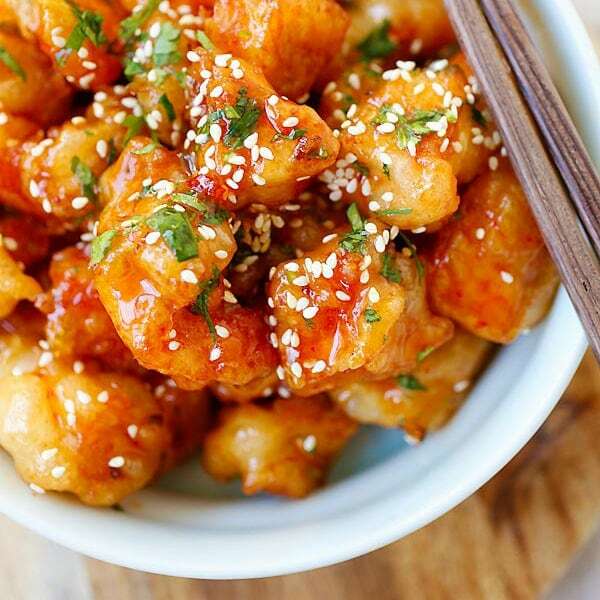 I tried this in my air fryer tonight! It was amazing and My 10 yr old loved it! Amazing and everyone loved it. I added honey to tame the heat and added a jalapeno. We grilled them. Used thighs and grilled them. I have been making this recipe for the last few years and it is always a hit. I use skinless chicken breast, since that is what I buy. I use korean red pepper and marinate for at least 2 hours. Going to go marinate some shortly for tonights dinner…however just realized I am out of olive oil ?. Will make do with what I have. Also using cilantro from my mom’s garden. Going to be delicious! Love this recipe! We make it once a week! This has become one of my children and my favorite recipes. I changed it slightly. I cut skinless chicken breast into cubes, marinate it and then cook it in a fry it in a fry pan. Delicious in a burito, over rice or in a salad!!! This has become one of my children and my favorite recipes!! I change it slightly by using boneless skinless chicken breast and cubing it. I then marinade it and simply pan fry it until golden brown and cooked through. It is great in a burito, over rice and in a salad! I actually keep some in the freezer in marinade to pull out in the morning and cook when I get home from work. ? Made this for the first time last night for dinner it’s now the hubby n kids fav!!!! Delicious ?!! Thank you for sharing! (My son wanted to post a comment cause he liked it so much! Also, my mom and mother in law stayed for dinner and they both asked me for the recipe. Definitely a keeper. Super easy and delicious!!! Hi Mirel, awww thanks for the comment. I am so glad that everyone love my cilantro lime recipe. Make sure you ask them to sign up my email newsletter so they get recipes in mail. 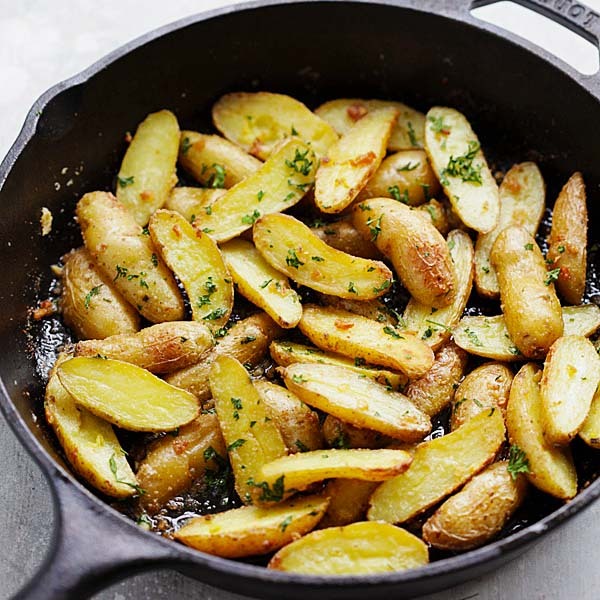 What would you recommend for a side dish to serve with this yummy recipe? It looks so delicious, I’d love to taste it. What if using other than chicken meat? such as goat / cow / or fish. Would it be different. I tried marinate chicken for half of hour and chicken’s flavor is really great! I made this last night for dinner, and it is for sure a keeper. We (3 adults) all loved it! I started by making the marinade in the food chopper. I grilled the bone-in thighs on the barbeque, just to get the skin crispy and get the cooking underway. I transferred everything to a baking dish and baked them for 45 minutes. I served it with brown rice (ooh, that yummy sauce from the chicken woke it right up! ), steamed zucchini, and sliced tomato. I will be making this again really soon, thanks so much! I was directed to this recipe from a list of “25 Best Recipes to Make in an Air Fryer” but find no directions for air frying. Any ideas? Hi Jim – that’s strange as this recipe doesn’t require air frying at all! Recipe may have been here a little while, but wanted to comment on it because it’s so dang good. I set up the marinade per the recipe and let it marinate an hour. I then sous vide it at 145 for 2 hrs, letting it cook in all those delicious juices, and drop it on a searing hot cast iron skillet to brown. I can eat it just like this, but the flavor of this chicken is perfect for fajitas. Hi! Could you cook this in the slow cooker? Made this last night using skinless chicken breast and cooked on the grill. Spectacular! Moist, flavorful, just the right amount of heat from the chili flakes. Hi Maria, thanks for trying my cilantro lime chicken. Can I make this only on a skillet??? Have made this for dinner twice now. Absolutely love it!! I made with boneless skinless chicken breasts and just cut down cooking time. Also, I love lime so I take half a lime and squeeze a little juice over each bite. This is so delish!! Hi Lori, sounds very yummy. I am glad you love this cilantro lime chicken recipe.